Paul Thomas Salata (born on October 17, 1926) is a former professional American football wide receiver in the National Football League (NFL) and the All-America Football Conference (AAFC). He was born to a Serbian-born father and second generation Serbian-American mother. He played for the AAFC/NFL's San Francisco 49ers (1949–1950) and the AAFC's Baltimore Colts (1950). After the Colts franchise folded in 1950 he was declared draft-eligible and was subsequently drafted in the tenth round of the 1951 NFL Draft by the Pittsburgh Steelers. He scored the 49ers final touchdown in the All-American Football Conference, as well as the team's first TD in NFL. 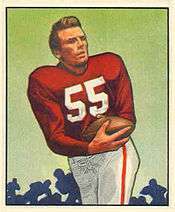 He also played 3 final seasons in Canada; 1952 with the Calgary Stampeders, where he was an all-star, and 1953 with the Ottawa Rough Riders. In later years, Salata became known for creating the Mr. Irrelevant Award in the NFL Draft, awarded annually to the last overall pick in the year's draft. After retiring from football, he became a businessman in Southern California. He has also acted in a number of Hollywood movies. He played Tony Minelli in Angels in the Outfield (1951) and appeared in the 1953 film Stalag 17 as a prisoner. ↑ Matt Maiocco, San Francisco 49ers: Where Have You Gone?, (Sports Publishing, 2005), 16.